Eyewear – A broad selection of safety glasses and goggles are available for your protection. Eyewash Stations – Low maintenance emergency eye wash stations. are available with stainless steel or plastic catch basins. Portable eye wash stations also available. Hearing Protection – Come to Prisco for a complete line of earmuffs, caps and plugs. Respirators – Prisco can supply a selection of respirators, cartridges/filters, as well as non-toxic particle/dust face masks. 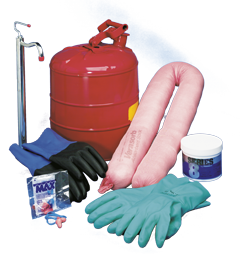 Gloves/Skin Protection – A full line of nitrile, neoprene, PVC, latex and vinyl gloves are available for all chemical resistance requirements. Protective Hand Cream – protects hands from all sources of contact dermatitis resulting from solvents, acids, alkalies and any water-born irritants in the pressroom. Non-greasy, has a pleasant odor and is easily applied. Cabinets and Storage Systems – Our approved storage containers provide storage and organization for your flammable and corrosive liquids. Horizontal and vertical drum storage cabinets and safety can storage cabinets are available. Safety Cans – Safety cans are available from 1 pint to 5 gallon capacities; oily waste cans from 6 to 21 gallon capacities. Pumps – Various safety drum pumps as well as plastic and metal pumps for 6-gallon cans to 55-gallon drums are in stock. Drum faucets are also available. Absorbent Materials – Absorbent materials to handle chemical spills are available in various formats: socks, pads, rolls and rugs. These materials are cleaner than clay granules and easier to handle. Prisco can also supply granulated absorbent material, upon request. Consult your Prisco representative for additional items that may be required for compliance with safety and environmental regulations.